well, here are the two things that caught my eye in the mountains...an old, aqua phone and a floral, iron chandelier. i know, you are probably thinking i have lost my mind- my husband sure thinks so. but i think that the aqua phone totally says "shannon darby design"...i think it's so fun to answer my work calls on this!! right when i saw it, i remember these. and thanks to my wonderful husband and father in-law, they got the ol' beaut back working. now i just have to figure out how to hook it up to my fax machine and it can move into my office. You're not losing it. I love them! Guys definitely don't get it! I LOVE these!! I hope people in my neighborhood read this and kindly leave me their cool retro phones and unloved beautiful chandeliers on the curb. Thank you! Post the photos of their new homes!! That phone is perfect!!! Great finds!!! 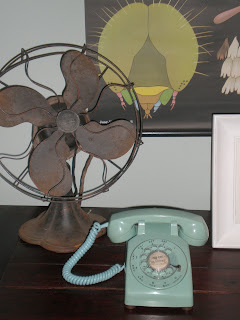 I love love the aqua phone and the shabby chandy! What great finds...other people's trash is my treasure too. I'm glad I'm not the only one who battles their husbands over these things. Why can't they just accept these facts of life? :) We are never going to change. Good finds. 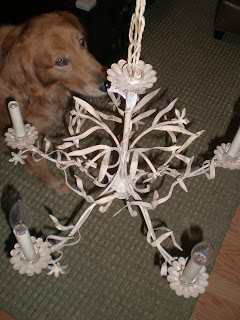 I can't wait to see your chandy up and running. (I borrowed that abreve from Steel Magnolia because I liked it).